On a dreary winters day in London, some of the most powerful people in the commercial aviation industry met to make a much-hyped major announcement. The event, which saw the chief executives from all 15 airlines that make up the Oneworld Alliance come together in one room, was in order for them to announce a “radical transformation” of the 20-year alliance. Unfortunately, that radical transformation didn’t include anything to improve gender equality. A fact that was all the more relevant for two reasons – the first because the aviation industry has one of the largest gender pay gaps of any industry and second because of two striking photos from the event that just goes to show how entrenched gender equality is in the airline business. The first photo as seen above is of the 15 executives gathered together: Abdelhamid Addou; CEO of Royal Air Maroc, Alan Joyce; CEO of Qantas, Alex Cruz; CEO of British Airways, Akbar Al Baker; CEO of Qatar Airways, Doug Parker; CEO and Chairman of American Airlines, Enrique Cueto Plaza; CEO of LATAM, Izham Ismail; CEO of Malaysia Airlines, Luis Gallego; CEO of Iberia, Kazuo Inamori; CEO of Japan Airlines, Pekka Vauramo; CEO of Finnair, RobGurney; CEO of Oneworld, Rupert Hogg; CEO of Cathay Pacific, Stefan Pichler; CEO of Royal Jordanian, Vipula Gunatilleka; CEO of Sri Lankan Airlines, Vladimir Obyedkov; CEO of S7 Airlines, and Willie Walsh; CEO of IAG. As is plainly obvious, not one of those chief executives is a woman – in fact, females are seriously underrepresented at a senior level across the vast majority of airlines the world over. A similar photo published by the International Air Transport Association (IATA) at its annual general meeting held in Sydney last June featured a roll call of its board of governors – along with 25 men stood just one solitary woman, Christine Ourmières-Widener the chief executive of British regional carrier Flybe. Only a handful of other women have ever held such a job – Carolyn McCall successfully led the British low-cost carrier easyJet but left the airline in the hands of a male successor in 2017. Meanwhile, Nguyễn Thị Phương Thảo who became Vietnam’s first self-made woman billionaire with her budget airline VietJet Air has been accused of sexualising flight attendants in order to grab the attention of male passengers. IATA admits there’s a problem – just 3% of airline chief executives are female and only 8% of chief financial officer posts in the industry are occupied by women. In contrast, the average overall percentage of female chief executives is a much higher 12%. The organisation said it would be accelerating programmes to improve gender equality at boardroom level and airlines have introduced programmes to encourage female interest in so-called STEM careers (Science, Technology, Engineering, Math and Medicine). Still, Qantas CEO Alan Joyce says it will take “a long time to fix some of the issues that are inherent in our society” and it looks like most airlines in the Oneworld Alliance (including his own) have a long way still to go. Back to today’s event and the second photo from the press conference which featured cabin crew from all the member airlines posing together. Of the thirteen cabin crew present, just one was male. The concern, of course, is that airlines continue to drive gender stereotypes with high profile publicity campaigns like this. 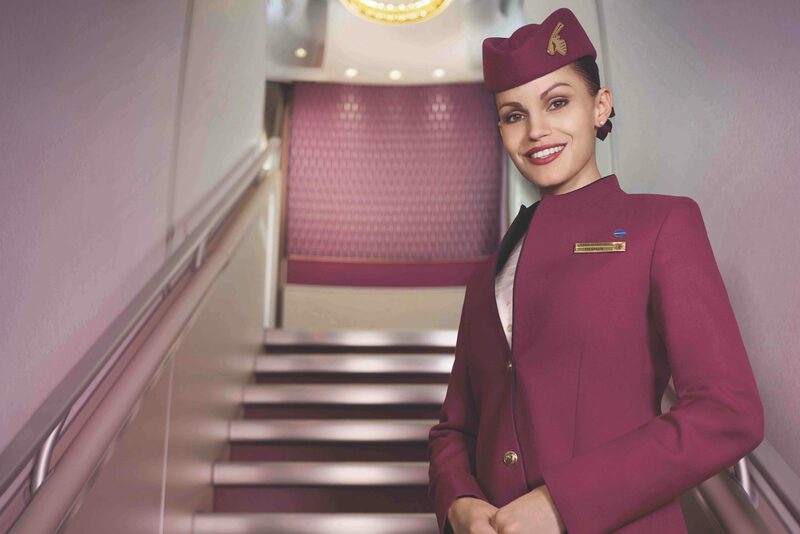 The message is clear – men should run the airline and women should be flight attendants. You might as well, have them posing in a galley making tea for a businessman and call it a day. The only male flight attendant in the photo works for Finnair – the flag carrier of a country that is the third most gender-equal in the world. If airlines are really committed to improving gender equality then they need to urgently look at how they represent men and women in publicity. It may well have been a coincidence that nearly every Oneworld member airline sent a female member of cabin crew to represent their brand – but chances are it wasn’t.